The Kitchen was given a complete transformation, with walls knocked down and a door added to add more natural light and create a modern, open-plan look for one of the most important areas of any house. The sense of space is enhanced by porcelain tiles and entirely new counters and lighting. The result is an enviable kitchen created to an extremely high standard. The bathrooms were given a similarly in-depth refurbishment, with all the old tiles and fixtures stripped out and replaced with modern fittings. The result is a barely recognisable transformation with travertine stone tiling and stylish detailing. The bedrooms were completely modernised, with new carpets and paint, enlargement of windows to allow more natural light, and new lighting and air conditioning ducts to replace the old fan cooling. As this renovation involved an extension to the house and the addition of a new master bedroom, the former master bedroom could be transformed into a second bedroom instead, with the door to a small ensuite and window to the front of the house (now the master suite) removed, and the horizontal window enlarged to add natural light to the room. The old laundry room was revamped with new tiles, colours to match the rest of the house, new appliances and fitted cupboards to create a far more appealing and practical workspace. Whether you are planning to extend and remodel your kitchen, add a bathroom or even add entirely new rooms to a house, we will work with you through each stage of your project and will create an extension you will be delighted with. Click here to find out more about our home extensions services. 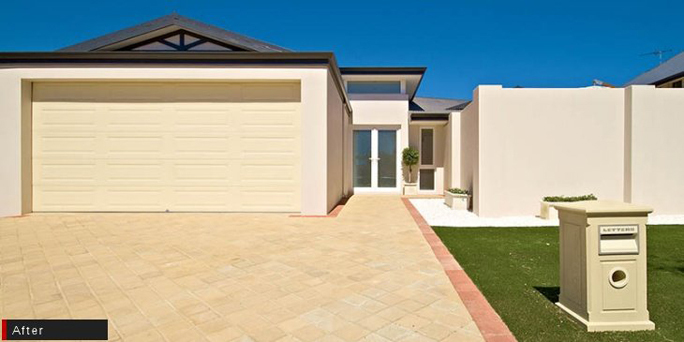 Designer Homes Perth offers a range of house refurbishment, home renovation and home extension services. If you would like a free, no-obligation consultation for your project, call Kris Aird on 1300 558 818.